Thank you for your enquiry, one of our representatives will be in touch shortly to confirm your details and supply a quote. 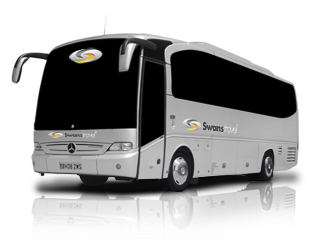 Swans Travel Group is a leading coach hire, chauffeur drive and taxicab company. With highly skilled staff and advanced technology, we are renowned for providing the very best luxury coach hire, executive chauffeur drive and taxicab services anywhere in the UK. We pride ourselves on offering a quality service at an affordable price, whilst ensuring the highest safety and environmental credentials.